The world as we know it becomes busier, louder and more stressful. That is why people are looking for ways to escape the everyday hustle and bustle. Unsurprisingly, meditation is rapidly gaining popularity because it helps people to find (inner) rest. Meditation exercises also play an important role in the Wim Hof Method. 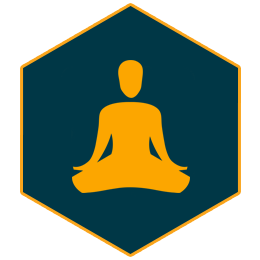 With our meditation techniques you can take control of your own body and mind. This control is essential if you want to practice the other fundamentals of the Wim Hof Method, which are conscious breathing and cold therapy. Thanks to the combination of breathing, cold exposure and meditation Wim Hof was able to achieve extraordinary things such as climbing Mount Everest in his shorts and swimming underneath the ice of a frozen lake. Do you also want to improve yourself and feel happier, stronger, and healthier? Start today! The Wim Hof method uses meditation techniques to clear the mind and create a relaxing atmosphere. To start meditating it is essential to get in a comfortable position, sit down and keep your back upright. Always make sure you are in a safe environment without any distractions. When you are calm and relaxed you can start focusing on your breathing. Breathing exercises are a big part of the Wim Hof Method. If you want to start practicing the Wim Hof breathing exercises you should first watch the online videos or practice with an instructor. Thousands of people from all over the world are practicing Wim’s meditation exercises on a daily basis. Throughout the years Wim has improved his method and now it is available for everyone who wants to become a more balanced person. Besides ordinary people, also a lot of celebrities and professional athletes benefit from the Wim Hof Method. This is because it helps them to perform better during their stressful and busy lives. The Method will make you happier, stronger and healthier within weeks. Wim Hof has created multiple video courses that will assist you in learning his scientifically underpinned method within the safe environment of your own home. The Fundamentals interactive video course will guide you step by step, from the fundamentals all the way up to an advanced level. Want to try the method before subscribing? Then download the Wim Hof Method app. Meditating, focusing, and getting in control of your body are the essentials of the Wim Hof Method. Without these essentials, you will not be able to withstand the low temperatures during cold body exposure or be able to breathe conscious during the different kinds of breathing exercises. Combine the three pillars and find your inner strength!